I have been wearing a Tilley hat since before we started cruising. 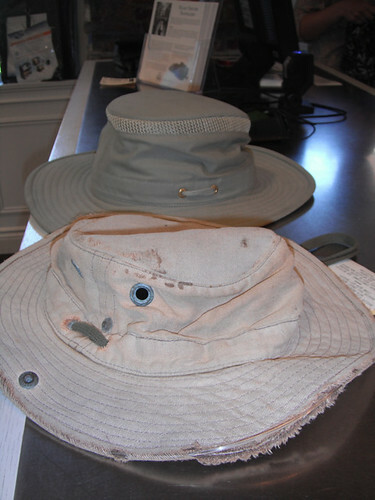 I wore my hat many hundreds of times in lots of difficult circumstances, like our Gallapagos shipwreck. My hat repeatedly was soaked in salt water and worn in harsh UV light. Recently I was in Victoria and was able to collect on the Tilley warranty. I was all prepared to tell them all about my travels, but they replaced my hat without asking any questions. My new hat has the wide brim, air vents in the cap, and has a lighter original colour. I think that these changes will make it more suitable for tropical use, as my previous hat tended to get rather hot. My new hat also has less metal, and so will presumably rust less. I hope to use my new hat enough to collect again on the warranty. I also have collected on the Tilly warranty, when I finally wore out mine after 4 years of rough use. That is sad that they did not ask any questions about your travels. You could of told them some amazing stories I bet. Take Care from Pam and Darren Australia ( In case you forgot who we are, we canoed around near your boat in fiji and came on board your wonderful boat. yes, i have/had pre cancer on top of my right ear, no big surprise with these base ball caps and all that outdoor in the sun stuff, though unlike you guys, no oceans to reflect the rays off.